James Jacob Spigelman AC, QC (born 1 January 1946) is a former Australian judge who served as Chief Justice of New South Wales from 1998 to 2011. 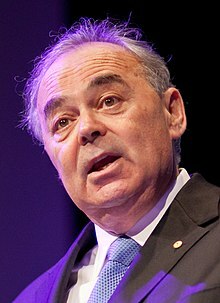 He was also Lieutenant-Governor of New South Wales from 1998 to 2012. He was appointed to the Court of Final Appeal of Hong Kong in April 2013 as a non-permanent judge from other common law jurisdictions. Spigelman also served as chairman of the Australian Broadcasting Corporation from 2012 to 2017. Spigelman was born in Sosnowiec, Poland, on 1 January 1946. He arrived in Australia with his family in 1949 and attended Maroubra Public School and later Sydney Boys High School. He then went on to study Arts at the University of Sydney, where he attained First-Class Honours in Government and Second-Class Honours (Division 1) in Economics. Subsequently, he studied law, graduating in 1971 with First-Class Honours and the University Medal. Spigelman participated in the 1965 Freedom Ride, a project undertaken by students to draw attention to problems faced by Indigenous communities in NSW. In 1969 he was President of the Students' Representative Council. From 1969-1971, he was the Student Fellow of the University Senate. Spigelman was admitted to practise as a solicitor in 1972. From 1972 to 1975, he served as Senior Advisor and Principal Private Secretary to the Prime Minister Gough Whitlam. In 1975, he was appointed the Secretary of the Department of the Media. In 1976 Spigelman was admitted to the NSW Bar. He did not commence practice until three years later, when he first served for several years as a member of the Australian Law Reform Commission and also spent time overseas. Spigelman's primary areas of practice at the bar included constitutional law, administrative law, and appellate work. In 1986, Spigelman was appointed Queen's Counsel; and, in 1997, he served as Solicitor-General of New South Wales. The Premier Bob Carr appointed Spigelman Chief Justice of the Supreme Court of New South Wales, and Lieutenant-Governor of NSW, effective 25 May 1998. Spigelman was regarded as the favourite to succeed Murray Gleeson as Chief Justice of the High Court of Australia when he stepped down in late 2008. However, this appointment went instead to Robert French. On 18 March 2011, Spigelman announced his decision to resign as Chief Justice, effective 31 May 2011. Reviewing Spigelman's 13-year term of office, Sydney Morning Herald columnist, David Marr commented that "... the Chief Justice of NSW .... blazed an incomparable trail.... every stage of Jim Spigelman's remarkable career has been like that: briefly surprising and then absolutely convincing". Marr claims that Spigelman's achievements include the renewal of the ranks of the Supreme Court, running a polite and friendly Court, and modernising the Court's business practices and rules. According to Bret Walker SC, Spigelman was renowned for "... showing his decided preference for efficient, better-value-for-money justice." He retired on 31 May 2011 and was succeeded by Tom Bathurst QC. Spigelman has also been a justice of the Supreme Court of Fiji. On 8 March 2012, Prime Minister Gillard announced Spigelman would become chairman of the Australian Broadcasting Corporation (ABC), starting a 5-year term on 1 April 2012. His term finished in March 2017 and he was replaced by Justin Milne in April 2017. Spigelman's parents, Gustawa and Majloch, are Holocaust survivors who feature in the graphic novel Maus by James Spigelman's cousin Art Spiegelman. Spigelman's surname was originally spelt Szpiegelman until his parents altered it to Spigelman after moving to Australia. Spigelman is married to author and clinical psychologist Alice Spigelman AM. She has a BA and MA in Psychology. Her directorships have included The Benevolent Society, UNHCR, Bundanon Trust, NIDA, Australian Institute of Music and the Rural Leadership Program. She is currently the Chair of Sculpture by the Sea having been a board member since 2010. Justice Spigelman became a Companion of the Order of Australia (AC) in 2000, for services to law and to the community through leadership in bringing about change in attitudes to the administration of justice for a more fair and equitable society, and to the support of the visual arts. In 2001, Justice Spigelman was one of over 15,000 Australians to be awarded a Centenary Medal. He has received honorary doctorates from two universities in Sydney: University of Sydney, Doctor of Laws (honoris causa), 2004; and Macquarie University, Doctor of Letters (honoris causa), 2012. ^ "Swearing In Ceremony of The Honourable J J Spigelman QC" (PDF). 25 May 1998. ^ a b c "The Honourable James Jacob Spigelman, AC". Chief Justices of New South Wales. Supreme Court of New South Wales. 19 May 1998. Archived from the original on 20 March 2011. Retrieved 18 March 2011. ^ a b c d e f g h "The Hon Justice James Jacob Spigelman AC". Honorary Doctor of Laws Conferral Citation. The University of Sydney. 28 May 2004. Retrieved 18 March 2011. ^ Whitlam, Gough (16 June 1975). "Appointments" (Press release). Archived from the original on 11 January 2014. ^ a b c Pelly, Michael (18 March 2011). "Spigelman quits as NSW Chief Justice, seven years before mandatory retirement age". The Australian. News Limited. Retrieved 19 March 2011. ^ "Government Gazette Appointments and Employment". Government Gazette Of The State Of New South Wales (96). New South Wales, Australia. 19 June 1998. p. 4415. Retrieved 3 March 2018 – via National Library of Australia. ^ Koutsoukis, Jason (9 March 2008). "Spigelman odds-on for High Court". The Sydney Morning Herald. Fairfax Media. Retrieved 19 March 2011. ^ Jacobsen, Geesche (19 March 2011). "Chief Justice announces he will retire". The Sydney Morning Herald. Fairfax Media. Retrieved 19 March 2011. ^ a b Marr, David; Jacobsen, Geesche; Snow, Deborah; Gibson, Joel (19 March 2011). "A time to refresh for a defining force". The Sydney Morning Herald. Fairfax Media. Retrieved 19 March 2011. ^ "Spigelman confirmed as new ABC chairman". Australian Broadcasting Corporation. 8 March 2012. Retrieved 9 March 2012. ^ "ABC farewells Chairman James Spigelman" (Press release). ABC Media Centre. 16 March 2017. Retrieved 27 July 2018. ^ "Justin Milne B.A., F.A.I.C.D". ABC. Retrieved 28 July 2018. ^ "SPIGELMAN, James Jacob - Companion of the Order of Australia". It's an Honour. Commonwealth of Australia. 12 June 2000. Retrieved 18 March 2011. ^ "SPIGELMAN, James Jacob - Centenary Meda". It's an Honour. Commonwealth of Australia. 1 January 2001. Retrieved 18 March 2011. ^ "Honorary Doctorate awarded to His Honour James J Spigelman AC QC". Macquarie University. 17 April 2012. Retrieved 20 April 2012.